I’m still reading exactly the same as I was last week, with one addition – I’ve started my month of Edgar Allan Poe (I’m getting it all in installments for free from DailyLit). You can get the running list HERE. 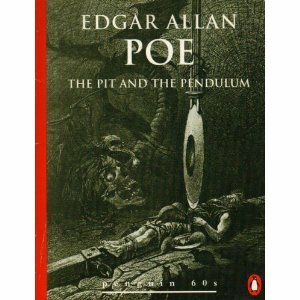 Anyway, I’ve started with The Pit and the Pendulum – Edgar Allen Poe’s 1842 Pit and Pendulum is the story of a prisoner trapped in solitary confinement during the Spanish Inquisition. The prisoner’s cell is completely dark and, unable to make sense of his surroundings without light or sound, the prisoner collapses. When his eyes open, the prisoner makes a horrifying discovery. A deep and deadly pit lies at the center of the tiny space, promising certain death if the prisoner were to fall. As he contemplates this grim prospect, the prisoner notices something else he did not see before: a pendulum with a sinister blade swings sickeningly back and forth overhead. As we read on, we find that these two horrible threats are not the only ones the prisoner will have to face. How will he ever survive? This entry was posted in Books and Reviews, Memes, W.. W.. W..Wednesday and tagged Books, Domestic Goddess, Edgar Allan Poe, Memes, WWW Wednesdays. Bookmark the permalink. Poe is great…creepy, but great! Hope you enjoy your month of Poe. Ooh reading Poe must be fun this time of year! My WWW is at The Crowded Leaf. It has been a long time since I have read any Poe!! BTW, I love the pink hair! I could be a bit biased since I have it, too! I love anything by Poe! Happy Reading!! I haven’t read much of Poe…just the popular ones that everyone knows. I do have the Penguin Collection of Poe on my Christmas wishlist, though. I live in Baltimore, so I really should know him better! By the way, I completely agree with #10 of your Comment Policy. That’s how I feel as well. Poe….that brings me back many years. Enjoy! I haven’t read any Poe since highschool! Probably should pick some up! Thanks for stopping by my WWW today!